Very close to Hanoi, just 1,5h. Fresh air, very nice resort. The water in the swimming pool at Forest in the Sky is warm. But be careful if you travel on the public holidays, the hotel will be very crowed and it takes long time for checkin and checkout. The hotel needs to upgrade the software system and improve management skills. This time it took me 1 hour for checkout. But overall i enjoyed my stay there. The only downside to this resort is lunch and dinner service. Terribly overpriced a la carte menu and the food is not of the best quality. They need to start spending more money hiring real chefs like they did architects. Room service is not much better either. And this is the first time I've ever been charged for ice. 50,000VND++ for a small bucket which would melt away in 20 minutes since the in-room fridge is absolutely pathetic. So prepare to consume your preferred cold beverages quickly. I took two stars away from cleanliness since our barely working fridge smells like pungent jackfruit the entire week we spent there. Breakfast buffet, which is included, is, however, really good. Other than that, everything is fantastic. In general we had a good time. 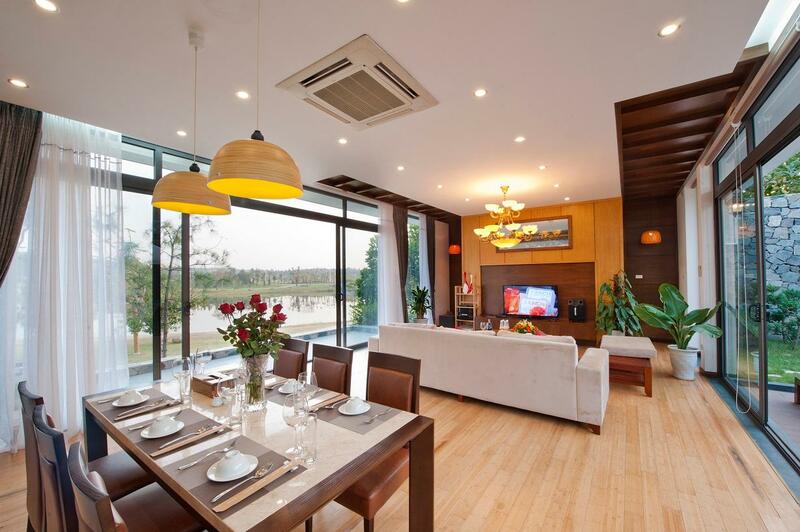 Living in Hanoi this is a great for a short retreat from the city. Rooms and especially bathrooms were beautiful. Resort is huge and has lot to do, the mountain bikes to ride around were a nice touch. Great breakfast. Will visit again soon. i am a bit dissappointed as u travel with family and booked a villa with kitchen but there is nothing in the kitchen except one fridge, not even a spoon to feed my baby. good condition,, but can't cook in house it's not so good.. The location, the surrounding and the facilities are great. But the food and services could have been better. Beautiful landscape with five star services. Good place for family, could be returned many times in near future. We booked a lake view villa and it was so nice view, peaceful and quiet. The breakfast was excellent. the service is not good. We had to wait so long for checking in until 3 pm, extra beds were not prepared as booking and we had to request many times for it.